I'm afraid that I don't know very much about this machine, other than it is placed in the gift shop that's associated with the ride. It looks like you can play it, too. You can indeed play the IJ pinball at Disneyland. I played it when I visited in December. I was surprised at how clean the playfield is and that everything worked! Had a pretty killer game...got two extra balls on my first ball and passed the game over to a couple of kids who were watching after my second ball. No replays on the game...just extra balls. I think you get an extra ball at 250M. The wood frame makes it hard to wrap your hand around the machine because the flipper buttons are recessed a bit under the wood. The stuff on top of the backbox is different than when I played it. When I played it, it had the bag on the left side, which looks the same, but on the right side, there was a dark brown crate and a snake hanging off the right corner. 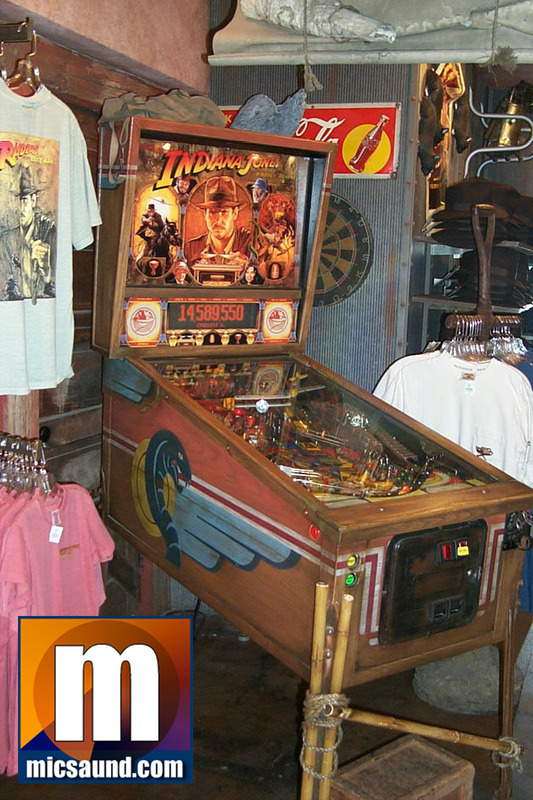 The gift shop that's associated with the ride is called: The Indiana Jones Adventure Outpost. The machine is themed by Imagineers to look like the old Ballyhole machines, with real wooden rails and lockbar. The bamboo is steel with a coat of epoxy resin and painted. This was not done to cleverly hide defects in the backbox. They theme many of the arcade machines in the park. None of the pinballs in the park can replay, they are set to novelty, with no match. High scores get extra balls. 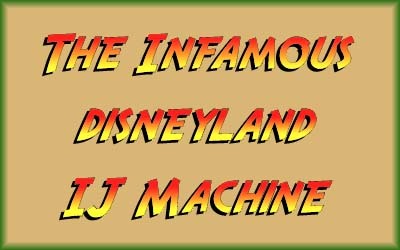 When the attraction first opened there were three things attached with screws to the top of the machine. A box of ammunition, a brown fedora and a whip. Two more boxes were built to raise children up off the floor, one of which can be seen under the machine in the photo. It had, for a very long time, been serviced by incompetents. The path of adventure wasn't working for three years, flipper coils were burnt out. The Grand Champion High Score "WIZ" was accomplished in three hours by yours truly. Return to the IJ Pinball Website home. If you have any neat info on this machine, please let me know and I can get it posted.